New York, USA -- I believe these days most of us (including, I understand, His Holiness the Dalai Lama) do not believe in the Six Realms as actual locations. Instead, they are more often understood as metaphors for our psychological projections. 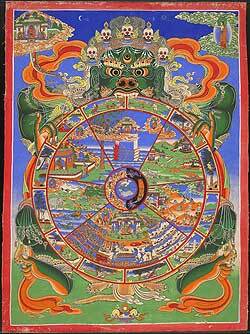 As such, it seems to me the Six Realms teachings shed light on our ongoing financial crisis. We're still hearing news stories about the luxurious lifestyles of Wall Street executives. Remarkably, even as their extravagant excesses were making headlines, some firms continued their frivolous spending. One firm that had received billion in taxpayer bailout money recently held a three-day conference for clients at a luxury oceanfront resort in Palm Beach, Florida. Another firm that had received billion in federal funds sponsored a five-day carnival near the site of the Super Bowl game at a cost of several million dollars. We're learning that Wall Street executives have to be told, as if they were children -- No, you may not buy new corporate jets. No, you may not add to your fleet of luxury limousines. Many, including one senator, are calling the executives "idiots" for their appalling lack of judgment. However, I think it's more useful to see the "idiot executive" phenomenon in the context of Buddhist teachings on human psychology and the Six Realms. For example, consider the teaching that outer reality is a projection of inner reality. I think it's fair to say that the leaders of the financial industry have been living in a very different reality from the rest of us -- more specifically, the god realms. The Six Realms include two god realms, which are sometimes combined into one -- the realm of Devas and the realm of Asuras. Asuras also are sometimes called the Jealous Gods or Titans. I think most corporate executives are Asuras. Asuras are hyper-competitive and paranoid. They are driven by a desire to beat their competition, and everyone is competition. They are greedy, yes, but (unlike, say, Hungry Ghosts) it's the desire to be at the top of the power pyramid that really drives Asuras. Their wealth is not so much the goal as it is the way they keep score. Understood this way, you might see how CEOs would be driven to take bigger and bigger risks, to the point of self-destruction, to stay on top. It's not in them to be prudent and sensible when the other Asuras are getting ahead. Frank Berliner, who teaches Buddhist psychology and meditation at Naropa University, makes some good points about Asuras. [The Asura realm] is much more sophisticated than the hell realm. Though based on the same underlying quality of aggression, it is far subtler, more politically correct. Whereas the hell realm is just bluntly out there with its hatred or violence in a way that is completely tortured, stupid and gross, the jealous gods mask and rationalize their fundamental arrogance and unfriendliness (until the right time to strike the enemy presents itself). ... ... In the jealous god realm, compassion is regarded merely as another strategy. In The Prince, Machiavelli writes that the great ruler should not really possess the qualities of wisdom and compassion, but he should seem to, particularly if and when it will further his own ends. If it will not, he should simply abandon such qualities right on the spot. Chih-i (538-597), a patriarch of the T'ien-t'ai school, described Asuras this way: "Always desiring to be superior to others, having no patience for inferiors and belittling strangers; like a hawk, flying high above and looking down on others, and yet outwardly displaying justice, worship, wisdom, and faith -- this is raising up the lowest order of good and walking the way of the Asuras." I'm saying the "idiot" Wall Street executives are not so much "idiots" as lost in their own projected reality. They don't see their own behavior as outrageous, because in their reality it's normal. I think that most corporate and political leaders have a foot, at least, in the Asura Realm, or they wouldn't be corporate or political leaders. Maybe a high-ranking executive or politician with the clarity to see the Asura Realm for what it is would not get utterly lost in it. But getting lost in the Asura Realm is always a danger for powerful people, including those we want to like.